I made this recipe and shared it with my boyfriend. He thinks it taste like a Whatchamacallit candy bar. I liked it enough I made it again less than a week later to share with my sister. I love that the recipe is small enough that you don’t end up with a bunch of leftover and over eat this treat. Melt chocolate and peanut butter. Stir in cereal. Refrigerate until solid. I used Honey Clusters Fiber One cereal. 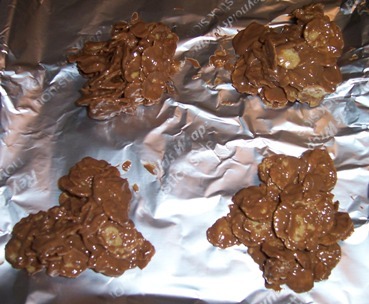 The recipe said it made eight pieces of candy at 1 WW point each. I made four pieces instead – making them 2 WW point each. Here’s a high protein and low in fat breakfast recipe. 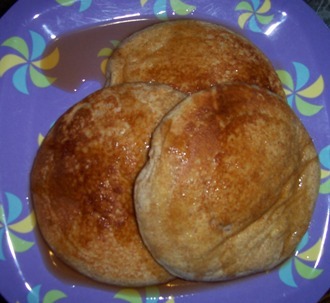 This recipe makes just two pancakes so it is perfect for single people like me. I liked it enough I’ve made it twice. Mix ingredients in a blender for 30 seconds and cook. Optional add-ins include berries, chocolate chips, and peanut butter.